AS VARIED AS MAKING MEATLOAF! Lentil Burgers, and Lentil Loaf is just the meatless version of meatloaf, so widely varied as you want to be with them, you need to experiment just like with meat loaf to get the right amount of binders in it to hold it together, and please experiment with all sorts of ingredients, never stick to one recipe, make your own! I cooked my lentils for approximately 15 minutes, not wanting them to be over cooked) the usual time is about 20 minutes. Again according to personal preferences, I tend to go heavy on the seasonings and use less salt in dishes I make, Since this was a larger recipe, made for the freezer, I used a Tablespoon of Italian Seasoning, 2 teaspoons dried Thyme, 1/2 –1 teaspoon Cayenne (good for circulation) and several pinches Crushed Red Pepper Flakes. (you need to be the judge on the amount, if you really drain the lentils you will need less, but run the risk of adding more liquid taken up by the oatmeal. Some I had not used before, but found at Whole Foods , in the bulk section so was able to buy a small amount. however during research I had noticed several recipes used this a s binding agent. (I mixed mine with the oatmeal before incorporating into the burger mixture. Once a gain you be the judge as you are mixing everything. Mix all together, and personally I find it easier to judge if I need more binders or liquid by chilling the mixture for an hour or two to see if it is going to hold together or is to dry, then adding what I need. Actually the sky is the limit on additions, seasonings the recipes I have found have wide in scope, some with Lemon or Lime Juice, fresh Dill, I really think you could make them in a majority of ways. Experimentation like with meat loaf is key! on earth) except dairy products. 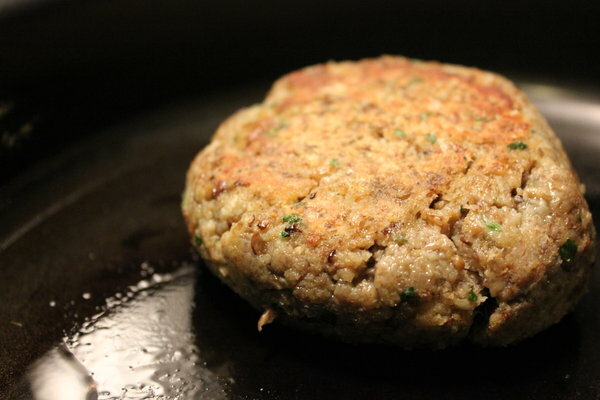 Lentil Burger Recipe–Coming This Weekend! I wanted to thank all the people that have inquired about the Lentil Burger recipe that I posted about several weeks ago. I was really surprised by numbers of emails and comments I received on the mention of the recipe. The reason I did not post that recipe is I wanted to make certain that it was not beginners luck. I wanted to get the same results twice. I am also been doing some research on making Lentil Bread, not sure when I will get around to this as all my bake ware is still packed up, so this recipe will be difficult without just buy new bread pans. Have you ever wanted something light to eat in the summer months? It is just to hot to cook, and you don’t want something too heavy but something that will stick with you for a while. If you are like me and try to survive just on straight salads, you find yourself rooting around the fridge and and cabinets several hours later looking for something else. Well since I have entered the Lentil phase of my life, I can honestly say nothing has been so satisfying as lentils. I have found nothing that will satisfy your hunger and stick with you like lentils. With this knowledge in mind and summer coming I wanted to find a lentil salad, which is nothing more than lentils and other typical salad ingredients. Actually the sky is the limit, only limited by your imagination. This evening I am going to make lentil salad, and best part it can be eaten cold from the fridge. Make a bowl and get some whenever you need a little something to stick with you. Since I am one to invent my recipes by taking the best parts of many recipes, the differences between recipes and concocting my own recipe, Lentil Salad is no different in this respect. Here is a list of the ingredients I am going to put into my lentil salad. I find that I use a lot less salt in recipes by adding spices like these, and also it perks up dishes that could be bland. You also could add chicken breast that has been diced. Thyme, basil, oregano, salt and pepper to taste. Whisk or blend all ingredients together, pour over the salad and mix together. Like I said above the varieties of these salads are only limited by your personal preferences and imagination. You know it is Spring, and you would think Chili would be the last thing on my mind, however in trying to see what all you can make with lentil experimentation is key. I have found that lentils are very satisfying and stick with you for a long time without making you feel stuffed. I had been wanting some chili, so I thought this would be a good time to experiment with this recipe and like most recipes it is entirely adaptable to your personal tastes. I used Red and Green Lentils, these are what I had on hand, though I would have used others also. I like the small golden lentils, and want to try the Black Beluga Lentils. Being close to Whole Foods, where they have a bulk section it is very easy to buy just what you need or want in the way of spices, grains, and the many other ingredient in bulk they offer, you can buy any amount from 1 bay leaf to a pound or more. I used ground turkey thighs in this recipe, which was on sale at Whole Foods the day I went in, as dark meat has more flavor than white meat. The Chili turned out more in the way of a thicker soup, than chili with beans, but you could easily add a couple tablespoons of corn meal to thicken it further, and add more tomatoes or tomato products. Brown the ground turkey in your pan with some olive oil, till done. Put water in pot, add bay leaf, granulated garlic (fresh can be used as well) , chopped onion, pinch of thyme. bring to a boil and add lentils. Bring to a boil, cut heat back to a slow boil, and cook for 10 –15 minutes, being careful not to over cook the lentils into mush, which I find happens easily past 20 minutes. Remove from heat, and ladle off the extra water, down to the level of the lentils, or a bit below depending on how soupy you like your chili. You could add puree, crushed, some paste, the key with lentils I find is that you will not be cooking it much past the point of initial cooking as you don’t want to over cook the lentils. Stir all together and let simmer just a few minutes. Serve as is, or with a dollop of sour cream, some grated sharp cheese. I did not add crushed red pepper, or cayenne which I generally use, as the light and dark chili powders seemed to have some heat as well as the chipotle peppers. I also thought that this would be good if you wanted a thicker split pea type soup by using a hand blender to puree the mixture. As with any soup, this recipe is easily adaptable to your personal tastes, would be good with chopped celery (would put in with the boiling water, or you could easily sautee’ the onion and celery together and add with the ground turkey. You may not like using the entire bunch of cilantro, I used the whole bunch because there has been reports that the use of cilantro helps chelate iron from the body, which since I retain most of the iron I take in is a good thing for me but perhaps to over powering for you. The addition of ground ginger, you may think I am crazy, but since it is good for stomach upset and gas, I use when cooking any legume (bean) which seems to help with flatulence, and you cannot tell that it is even in the recipe.